Cabine près de Boone, Blowing Rock, Blue Ridge Pkw - Vues exceptionnelles! Taux bas! TOP RATED - LISEZ NOS AVIS !!! Les dates de vacances de Pâques / printemps viennent d'ouvrir !!! 5 minutes de Blue Ridge Parkway. Vues superposées sur la montagne depuis une grande et belle cabine sur 6 hectares! Comfy, 2000 sq ft cabine 6-7 personnes: grande cuisine, salle à manger et une grande chambre. Génial pour les familles. Nous avons Internet haut débit gratuit et télévision par câble !!! Vous ne serez pas déçu par cette jolie cabine avec intimité et accès facile aux sites touristiques à proximité! Notre maison dégage une atmosphère chaleureuse, confortable et ouverte avec beaucoup d’espace pour cuisiner, manger, jouer à des jeux, regarder des DVD, lire et se détendre. Il ya plusieurs zones de rassemblement afin plusieurs activités peuvent être en cours à la fois. Il ya un porche couvert qu'une table de patio et des chaises - idéal pour les jours de pluie, les jeux de société ou d'avoir un petit coin loin du reste de votre groupe. Il ya une deuxième table et des chaises sur la grande terrasse arrière qui donne sur la vallée et les montagnes. Accès facile à plusieurs des meilleures attractions de la région, y compris la montagne Grandfather, Blowing Rock, le chemin de fer Tweetsie, l’État des Appalaches, la Promenade Blue Ridge, l’extraction de pierres précieuses, le canoë-kayak dans la New River, le vélo, la pêche, etc. S'il vous plaît soumettre ENQUÊTE plutôt que demande de réservation afin d'obtenir plus de détails et parler avec le propriétaire !!!!! ANIMAUX DE COMPAGNIE: Nous autorisons 1 chien (pas de chat) de moins de 35 lb pour 20 $ par nuit. Dans de rares cas, nous pouvons autoriser deux chiens et les frais resteraient 20 $ par nuit et par chien. TOUT animal de compagnie doit être approuvé par le propriétaire avant la réservation est finalisée. Un certain nombre de jeux de société, Bibliothèque de livres de poche, Rocking Chairs, porche couvert avec table, pont arrière avec vue sur la montagne possède la deuxième table, la cuisine a couverts et argenterie pour 12, la propriété est sur six acres de terrain boisé. Great New Years get away! The cabin was exactly as described. It was VERY clean and comfortable for our family of five. John was easy to work with and answered all questions VERY quickly. We'll absolutely stay again. Drew, Thanks for the thumb's up. We enjoy sharing our place and glad your family had a great time bringing in the New Year in the beauty of the NC mountains. Come back soon! Comfortable cabin with amazing views. Kitchen with all utensils and appliances you could need (large and small). Plenty of beds for everyone. Location was perfect - close enough to grocery store but far enough to feel secluded. Plenty of land to walk & sound of running brook nearby. Walking into Highridge House was instantly breathtaking and even more beautiful in person. My husband and I took our two sons age 8 months old and 23 months old along with our two small doggies to the mountains to celebrate Thanksgiving. My mother and father in law accompanied us as well. Four adults, two children and two doggies with more than enough room to have our own space or curl up together as a family by the fire. Any cook will love the kitchen and dining area that is the best equipped we have ever rented. I cooked my family a complete Thanksgiving dinner in ease with everything at my fingertips( the few things I brought from home they even had such as turkey baster. Awesome quality roasting pans, casserole dishes, pie plate the whole nine yards. Ample seating at the huge island as well as the dining room table. We loved the decor of the cabin for the fall season. Being a mom of two under two years of age, I had the best sleep in over two years. Master bed so comfortable when we returned home I contacted John asking the make and model of his bed. We loved waking up to the phenominal view off of the deck each morning. I can only imagine how amazing spending time on the decks are in the summer. I have already asked my husband if we can vacation again at the Highridge House. By far, the best customer service by the owners. I spoke on the phone prior to booking our trip with John a couple of times as well as texting simple questions about kitchen supplies and always a quick response. We spoke at length where to foodshop, points of interest etc. He even checked in on us day of arrival to see how our trip was and if everything was to our satisfaction with the cabin. He even assured us to contact him at any time. My only recommendation for the home itself would be for some more hangers to hang your clothes or more dresser space; however, this does not take anything away from our vacation. We would highly recommend to take the owners advice for navigating getting up the driveway. After a couple of rides up and down the driveway we felt more comfortable; however, a small guardrail in a couple of spots wouldn’t be a bad idea. We took drives into Boone, Blowing Rock, West Jefferon and through many country roads. We completed our family trip by visiting a mom and pop Christmas Tree Farm and cut down a few trees to bring home for our family and friends. 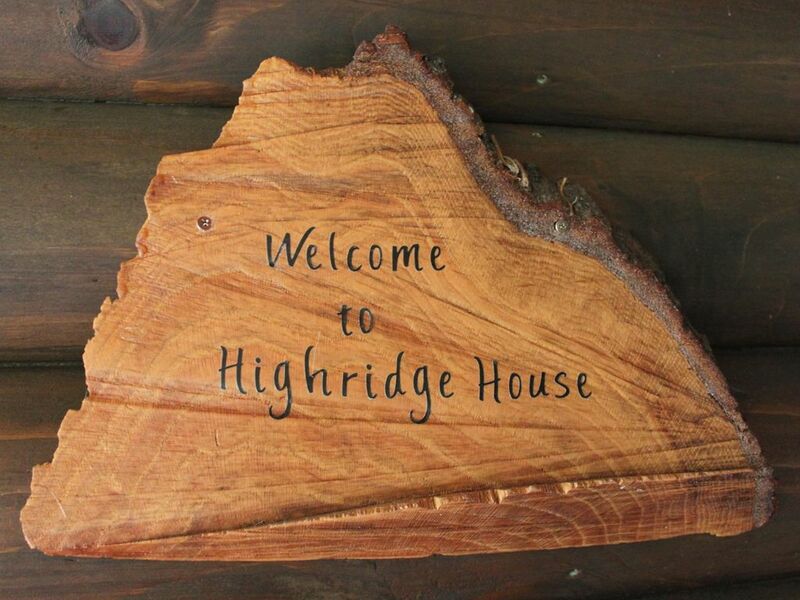 We would highly recommend booking Highridge House and would stay here again. Fondly, The Pomicters. Thank you so much for your kind words and detailed review! We were so happy to have you and your family especially for a holiday like Thanksgiving. We do want our guests to feel like it is their second home and build family memories. Do come back - it is a great place any season of the year. Wishing many blessing to your whole crew! The pictures do not do the views justice. This beautiful, comfortable cabin was a great getaway for us and our 3 toddler boys while attending a wedding at Sky Resort. The owner is great, communicative and ready to help with problems. This cabin is a real value at this price per night. Our week in John’s cabin was amazing! So comfortable and cozy., John was so attentive to our needs! He is so accommodating and had such attention to every detail! Definitely recommend spending time here! So much to do or just relax on the porch.. views are spectacular..
Don't miss this gem! Beautiful View and lovely home! This beautiful mountain home has incredible views and wonderful peace and serenity. The home itself is well equipped with anything you could want for cooking, serving and relaxing. It is so beautifully decorated it feels like it could be your own home from the moment you walk in! My whole family loved it - especially that it is on one level so everyone could have their own space and not be too far from each other. The owner was so gracious and accommodating. We are looking forward to coming back again! En voiture ou en randonnée Blue Ridge Parkway à moins de 5 minutes. Canoe ou le tube sur New River. En novembre / décembre 50 «choisir et couper" fermes d'arbres de Noël dans la région. The pet fee of $60 is for 2 nights stay and 1 pet. If there are additional pets and/or stay is longer than 2 nights, the pet fee will increase. Pets are allowed only after approval of owner. We ask guests to pay $5 - $10 per night for wood depending on how much is used during your stay. This is done based on an honor system. HOLIDAY RATES: Please contact Owner. Holidays are Labor Day, Thanksgiving, Christmas, New Years, MLK day, Valentines Day, Memorial Day, July 4th, Easter week.